Historian Adam Hochschild’s new book “Spain in Our Hearts: Americans in the Spanish Civil War, 1936-1939” tells the stories of Americans who volunteered to fight, moved by ideology, worldwide economic depression, or the rise of Hitler. Most of us, if we remember the Spanish Civil War at all, know it as a bloody European warmup for World War II, or as a conflict that inspired a lot of great literature. One side — the embattled Republic, the legitimately elected government — fought with the help of Stalin. The other — the rebellious right-wing Nationalists, led by Gen. Francisco Franco — enlisted the enormous resources of both the Nazis and Italy’s fascist dictator, Benito Mussolini. The fighting was vividly reported by writers and photographers, among others Ernest Hemingway, who based his novel “For Whom the Bell Tolls” on his reporting there. British writer George Orwell’s “Homage to Catalonia,” a memoir of his service as a soldier in the Republic’s army, remains a classic of narrative nonfiction. Historian Adam Hochschild’s new book, “Spain in Our Hearts: Americans in the Spanish Civil War, 1936-1939” (Houghton Mifflin Harcourt, 464 pp., $30), revives the memory of that terrible time. He tells the stories of Americans who volunteered to fight, largely for the cause of the Republic, moved by ideology, worldwide economic depression or the rise of Hitler. News of Stalin’s purges had yet to leak out of the Soviet Union, and many Americans saw communism as a legitimate alternative to fascism. Some joined the American Communist Party. Others actually moved to the Soviet Union. 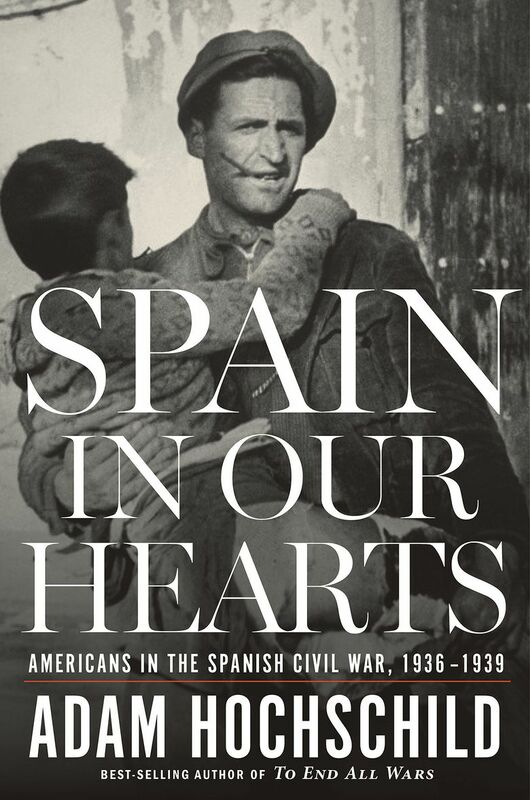 The author of “Spain in Our Hearts” will appear at 7 p.m. Thursday, April 7, at the Seattle Public Library, 1000 Fourth Ave.; free (206-386-4636 or spl.org). Co-sponsored by the Elliott Bay Book Co.
Robert Merriman and his wife, Marion, met at the University of Nevada. Bob was an athletic young scholar who joined the ROTC to make money. Marion was a member of a sorority. Bob enrolled in graduate school and the couple moved to Berkeley, where they sheltered jobless friends and Marion’s 8- and 11-year-old sisters. Times were tough. The Soviet Union was hiring teachers and engineers — Bob and Marion moved there. The travels of this young and idealistic couple out for adventure took a darker turn, as Bob traveled to Spain to fight for the Republic and Marion, for a time, followed him. They joined thousands of Americans who volunteered for the fight — butchers, longshoremen, trust-fund heirs — as they entered the maw of a conflict that would claim many of their lives. The fledgling Republic was trying to pull Spain from a feudal state into the modern age, but its power structure was riven by internal conflicts. When the exiled Franco — aided by wealthy but dispossessed landowners, the Catholic Church hierarchy and both Hitler and Mussolini — attacked, the Republican troops were overmatched. Hochschild has diligently documented the story of an American oilman, Torkild Rieber, who sold Texaco oil on credit to Franco. Texaco’s shipping fleets funneled intelligence to Franco’s troops, resulting in the sinking of ships attempting to get supplies to the Republican army. Writers of the caliber of Hemingway, Orwell, New York Times reporter Herbert Matthews and magazine correspondent Virginia Cowles followed the fortunes and misfortunes of the International Brigades, the portion of the Republican Army made up of Americans and soldiers from many other countries. Their stories didn’t move the needle of American opinion. President Roosevelt, fearful of a backlash as he tried to end the Depression, refused to send aid or to allow the Republic to buy American weapons. Britain ignored the Republic’s pleas. France followed Britain’s lead. Only Stalin helped — for a time. Hitler and Mussolini exulted in the opportunity that the war provided, that of a virtual practice run for the aerial bombing that dominated World War II, as German Stuka Ju-87 dive bombers strafed fighters and civilians alike. Hochschild does not spare the reader the particulars of fighting conditions. Soldiers in rags fought for days without food or sleep, often with guns so antiquated that no one could figure out how to fire them. Death, whether by bullet or by bomb, was commonplace. Hochschild’s account of atrocities perpetrated by both sides, but particularly by Franco’s troops, puts today’s terrorist violence in grim perspective. Incredibly, many Americans among the 2,800 who volunteered made it through. Others, loosely estimated at about 750, did not, and in some cases their bodies were never found. All told, an estimated half-million people died, either in battle or by execution. The title of this exemplary book comes from a quote by French writer Albert Camus. “Men of our generation,” he wrote, “have had Spain in our hearts … It was there that they learned … that one can be right and yet be beaten, that force can vanquish spirit, and that there are times when courage is not rewarded.” Hard lessons, but worth learning again from this moving and powerful account. Mary Ann Gwinn: 206-464-2357 or mgwinn@seattletimes.com.